Italian communications satellite.talian communications satellite. AKA: Sicral. Status: Operational 1991. First Launch: 1991-01-15. Last Launch: 2009-04-20. Number: 6 . Gross mass: 1,865 kg (4,111 lb). Italsat was a body stabilized experimental geostationary satellite which provided pre-operational domestic Italian telecommunications services in the 20/30 GHz bands. Italsat 1, 2 Communication satellite built by Alenia Spazio, Italy. Launched 1991 - 1996. Used the GeoBus (Italsat Bus) bus. SICRAL 1, 1B Military communication satellite built by Alenia Spazio (#1); Alcatel Alenia Space (formerly Alenia Spazio) (#1B) for Italian Ministry of Defense, Italy. Launched 2001 - 2009. Used the GeoBus (Italsat-3000). Launched 2001-2009. Artemis European communications technology satellite. One launch, 2001.07.12. Artemis was a European Space Agency satellite to test new communications technologies. Experimental communication satellite built by Alenia Spazio for ESA, International. Launched 2001. Used the GeoBus (Italsat Bus) bus. Family: Communications, Geosynchronous orbit, Technology. Country: Italy. Launch Vehicles: Ariane, Ariane 44L, Ariane 5, Ariane 5G, Zenit-3SL. Projects: Eutelsat. Launch Sites: Kourou, Kourou ELA2, Kourou ELA3. Agency: Telespazio. Bibliography: 2, 296, 4, 552, 554, 6, 12694, 12695, 12696. Italsat 1 - . Mass: 1,865 kg (4,111 lb). Nation: Italy. Agency: ASI. Class: Communications. Type: Civilian communications satellite. Spacecraft: Italsat. USAF Sat Cat: 21055 . COSPAR: 1991-003A. Apogee: 35,919 km (22,318 mi). Perigee: 35,817 km (22,255 mi). Inclination: 4.20 deg. Period: 1,440.20 min. 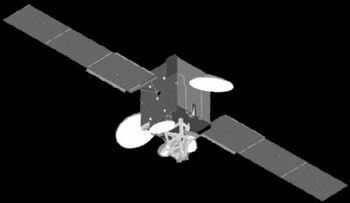 Experimental commsat; 13.2 deg E. ITALSAT is a body stabilized geostationary satellite and it is proposed to provide pre-operational domestic telecommunications services on the 20/30 GHz bands. Geographic longitude 13.2 deg E. Longitudinal tolerance +/- 0.1 deg. Positioned in geosynchronous orbit at 13 deg E in 1991-1999 As of 4 September 2001 located at 144.14 deg E drifting at 1.021 deg W per day. As of 2007 Mar 11 located at 86.26E drifting at 1.156W degrees per day. 1996 August 8 - . 22:49 GMT - . Launch Site: Kourou. Launch Complex: Kourou ELA2. LV Family: Ariane. Launch Vehicle: Ariane 44L. Italsat F2 - . Mass: 1,865 kg (4,111 lb). Nation: Italy. Agency: ASI. Class: Communications. Type: Civilian communications satellite. Spacecraft: Italsat. USAF Sat Cat: 24208 . COSPAR: 1996-044A. Apogee: 35,801 km (22,245 mi). Perigee: 35,771 km (22,227 mi). Inclination: 0.00 deg. Period: 1,436.10 min. Positioned in geosynchronous orbit at 13 deg E in 1996-1998; 16 deg E in 1998-1999 As of 5 September 2001 located at 16.38 deg E drifting at 0.010 deg E per day. As of 2007 Mar 10 located at 94.10W drifting at 1.863E degrees per day..
2001 February 7 - . 23:05 GMT - . Launch Site: Kourou. Launch Complex: Kourou ELA2. LV Family: Ariane. Launch Vehicle: Ariane 44L. Sicral - . Payload: Sicral 1. Mass: 2,596 kg (5,723 lb). Nation: Italy. Agency: ADI. Manufacturer: Alenia. Class: Communications. Type: Civilian communications satellite. Spacecraft: Italsat. USAF Sat Cat: 26694 . COSPAR: 2001-005A. Apogee: 35,801 km (22,245 mi). Perigee: 35,773 km (22,228 mi). Inclination: 0.10 deg. Period: 1,436.10 min. Sicral, (Sistema Italiana de Communicazione Riservente Allarmi) was a communications satellite for the Italian defense ministry's procurement division, the Segretariato Generale della Difesa's Direzione Nazionale degli Armamenti. Sicral was built by Alenia Aerospazio and derived from the Italsat series. Its mass was 2596 kg full, 1253 kg dry and it carried a liquid apogee engine. The 3.3 kW, 3.4 m x 4.9 m, triaxially-stabilized spacecraft carried a total of nine transponders in the SHF-, UHF-, and EHF-bands to enable secure communications after parking over 16.2 deg-E longitude. Positioned in geosynchronous orbit at 16 deg E in 2001 As of 26 August 2001 located at 16.27 deg E drifting at 0.004 deg W per day. As of 2007 Mar 9 located at 16.34E drifting at 0.018E degrees per day. 2001 July 12 - . 21:58 GMT - . Launch Site: Kourou. Launch Complex: Kourou ELA3. LV Family: Ariane 5. Launch Vehicle: Ariane 5G. Artemis - . Mass: 3,105 kg (6,845 lb). Nation: Europe. Agency: ESA. Manufacturer: Alenia. Class: Technology. Type: Communications technology satellite. Spacecraft: Italsat. USAF Sat Cat: 26863 . COSPAR: 2001-029A. Apogee: 32,586 km (20,247 mi). Perigee: 32,451 km (20,164 mi). Inclination: 1.10 deg. Period: 1,272.40 min. Artemis was a European Space Agency satellite designed to test new communications technologies. The Ariane 510 vehicle failed to reach its correct orbit. The solid boosters and main stage worked as planned and put the EPS upper stage in the planned near-suborbital trajectory. The EPS stage then fired but the Aestus engine failed to reach full thrust and cut off 1 minute early. Instead of the planned 858 x 35853 km orbit, only a 592 x 17528 km orbit was reached. The 3.1 tonne (with fuel), 2.5 kW spacecraft carried two pairs of ion engines and had adequate xenon propellant for those engines to reach geosynchronous altitude. This was the first ever rescue of a satellite mission using electric propulsion. The satellite reached its operational orbit in 31 January 2003.using the four German RITA electric xenon thrusters. Artemis could then function as originally planned, as there remained sufficient chemical propellant for 10 years' operation. Artemis was to provide voice and data communications between mobile phones in Europe and North America, and act as a relay satellite between low-Earth orbiters and ground stations. Eventually, as part of the planned EGNOS system (to be operational by about 2010) it was to provide navigation/location determination as an independent European counterpart to the GPS and GLONASS fleets. As of 2007 Mar 11 located at 21.40E drifting at 0.001W degrees per day. 2002 August 28 - . 22:45 GMT - . Launch Site: Kourou. Launch Complex: Kourou ELA3. LV Family: Ariane 5. Launch Vehicle: Ariane 5G. Atlantic Bird 1 - . Mass: 2,700 kg (5,900 lb). Nation: Europe. Agency: Eutelsat. Manufacturer: Alenia. Program: Eutelsat. Class: Communications. Type: Civilian communications satellite. Spacecraft: Italsat. USAF Sat Cat: 27508 . COSPAR: 2002-040A. Apogee: 35,787 km (22,236 mi). Perigee: 35,786 km (22,236 mi). Inclination: 0.10 deg. Period: 1,436.10 min. Launch delayed from August 27. Atlantic Bird was a European (EUTELSAT) geostationary communications spacecraft. The 2.7-ton (1550 kg dry with 1150 propellant), 5 kW satellite was to provide voice, video, and Internet services to Europe and the eastern part of America through its 24 transponders after being parked over 12.5� W. As of 2007 Mar 10 located at 12.49W drifting at 0.006W degrees per day.